Probiotics are live microorganisms that may be able to help prevent and treat some illnesses. Promoting a healthy digestive tract and a healthy immune system are their most widely studied benefits at this time. These are also commonly known as friendly, good, or healthy bacteria. Probiotics can be supplied through fermented foods, beverages, and dietary supplements. The fermented foods listed in the link below are excellent choices to add to your pet’s food (avoid the chocolate). Prebiotics are substances that induce the growth or activity of microorganisms (e.g., bacteria and fungi) that contribute to the well-being of their host. The most common example is in the gastrointestinal tract, where prebiotics can alter the composition of organisms in the gut microbiome. Probiotics introduce healthy live bacteria into your dog or cat’s gastrointestinal system, for the purpose of aiding digestion, promoting gastrointestinal health and supporting immune function. 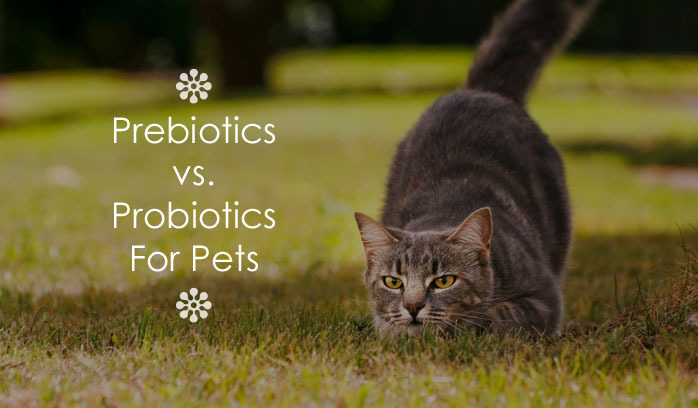 Alternatively, prebiotics do not introduce new living bacteria but are a non-digestible, fibre compound that supports and encourages the growth of healthy bacteria which are already in your pet’s digestive system. The stomach of a cat or dog purposely stays very acidic for a long period of time, to kill off potential bacterial contamination, which would include the “healthy” bacteria in a supplement. Not all probiotics manufactured for pets will survive this harsh environment. There are only some strains of probiotics that can survive, but they do not seed the intestinal tract as most people think. These are typically transient and adjust the pH of the intestinal tract creating a better environment for the existing bacteria to thrive and grow. We know that intestinal health is important for our pets. Therefore, probiotics sound like a logical aid to that objective. But because of the fact that your pet’s stomach is so acidic, we think that a better solution is to nurture the good bacteria that is already there. This is what we have chosen to do with BiologicVET pet supplements. A high quality prebiotic will promote intestinal health by removing toxins and producing a friendly environment for healthy bacteria. Secondly, for immune health, prebiotics are a food source to nourish the bacteria so they can grow in numbers. Although not a veterinary doctor, Dr. Josh Axe, DNM, DC, CNS, explains the benefit of prebiotics which are applicable to humans as well as dogs and cats. We agree that intestinal health is important for our pet’s overall health and therefore we want to nurture and feed the bacteria necessary for intestinal and immune system health. While probiotics can be helpful, we feel that pet nutritional supplements that include prebiotics are much more efficacious and better suited for the harsh landscape of your pet’s gastrointestinal system.